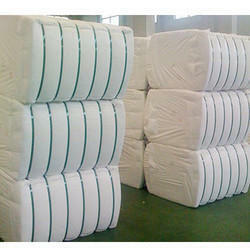 Cotton Bale Strap provides maximum load stability for loads that shrink and settle during transit. Stronger than other plastic strapping materials, its excellent elongation and recovery characteristics help straps stay tight and absorb impacts without breaking. Unlike steel strapping, Tenax can reduce indentation at unprotected package corners and does not rust and stain products when exposed to the elements. It’s also safer to handle than steel strapping and will not damage forklift tires. Cotton Bale Strap is proven to be highly effective in hundreds of applications that require exceptional strength and high retained tension. It performs smoothly and reliably in power strapping machines and manual application tools. Looking for Cotton Bale Strap ?